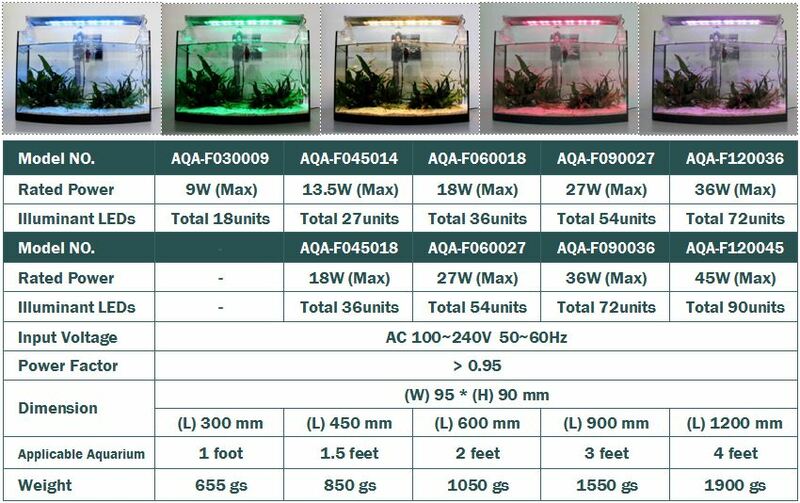 AQUAFAERIE LED AQUARIUM LIGHT - High quality Taiwan AQUAFAERIE LED AQUARIUM LIGHT provides by STANDARD WORLD INC.
■ Designed with five motif colors, available for variety fine-tuning mixture shades. ■ Support RF (or Bluetooth) remote control for light dimming and tone looping. ■ Sleek-shape anodized aluminum lamp body and polycarbonate bracket stand. ■ Luminous Decay Rate:< 7% after 10,000 hours.